After the first New York Skate Series, one of the boxes was left as a donation to the community. Check the edit featuring Jordan Baez, Joey Scannella, Xavier Gilliam, and Warren. Featuring Billy Gonzalez, Brian Keohane, John Dorio, Kevin Cintron, Sean Grossman, Moises Rivera, Leomarsh Pascasio, Sal Zaso, Phil Weaver, Jordan Baez, Neal Acosta, Julian Hinsch, Hector Rodriguez, Austin Croteau, Xavier Gilliam, Daniel Stewart, and Kris Craig. Filmed and edited by Antonio Lassalle. Joey Scannella gives us a sneak peek into an upcoming edit he’s working on, with this edit created with unused clips. “Won a Pair of Valos while competing in the Texas Skate Series competition in Austin back in May, and received the Valos about 2 days after MotorTown Classic. been filming on them for about 4 weeks and this is the result of it. ALL NYC clips except for the Last one which was in the Gnarden State Street comp in NJ in which I placed 3rd place. Filmed by: Augusto Castillo, Jesus Medina, Xavier Morel, Angel Ramirez, Jordan Baez, Osbel Velez, and Chris Santiago. Edited by: Pablo Munoz” – Pablo Munoz. “All shot between 12am-6am. Featuring: Augusto Castillo, Pablo Munoz, Ian Copp, Austin Croteau, Chris Santiago, and Christian Brito.” – Augusto Castillo. “2 Years ago today I lost one of my best friends Alex Nunez…Not only was he my best friend but he was also somebody I Looked up to for over 14 years..Before Alex Passed he gave me this song and said it would be great for the film…Today we Honor the King of queens….Rest in Peace Alex Nunez you will always be in our hearts forever…Here is his profile I Filmed/Edited from my latest Film Release Go 4th” – Thomas Lipani. We are proud to introduce the New York Skate Series. NYSS is a collaborative effort from local New York City and surrounding area bladers to organize a series of competitions and events to improve the rollerbladering scene of NYC. 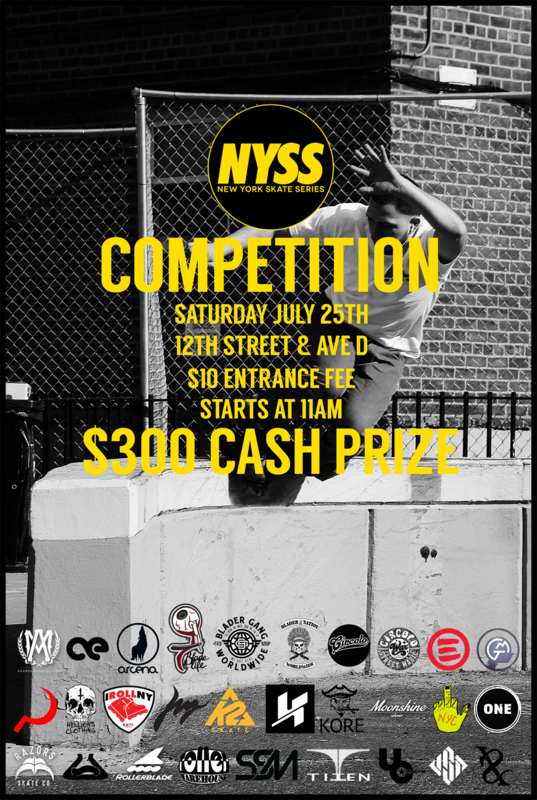 NYSS will be hosting it’s first competition Saturday, July 25th at 12th Street and Avenue D. Check the flyer below for more information and stay tuned to the New York Skate Series Event Page for updated information. Date: Saturday, July 25, 2015.